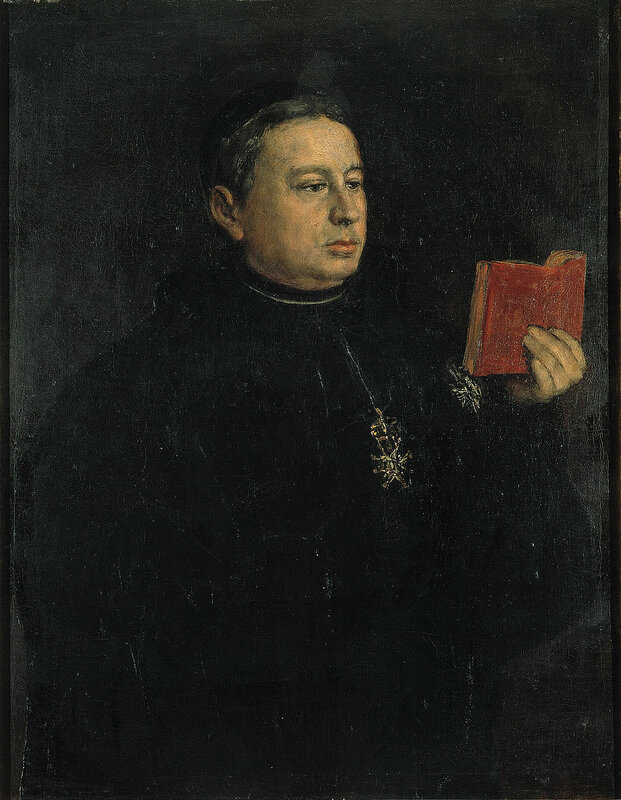 “Manuel Osorio Manrique de Zuniga”, 1788. At 70, I guess I typify the grisaille demographic that dominated the visitor numbers at the National Gallery’s show of Goya portraits. Goya’s an ‘old master’, safely beyond the reach of the contemporary agenda you might think, and in no need of approving or disapproving evaluation. With critical judgement suspended, the paintings should have offered an escape into the comparative certainties of the past, which is perhaps the main appeal of such exhibitions, especially for senior citizens. But while we might enjoy heritage excursions back into art history, the work itself has travelled in the other direction, into a future Goya never could have envisaged. The portraits arrive in our present, entering into our early 21st century culture, where, rather than being admired as a pleasurable anachronism, they present an unexpected challenge that tells us more about our times than a show of contemporary art would necessarily reveal. I think what the Goya portraits tell the modern audience has to do with ‘experience’. Two connected definitions of experience are in play: Evidence for the first lies in the treatment of the faces, and for the second, in the clothes. In many of the portraits, as reviewers have mentioned, the subject’s faces appear overworked as though the painter had spent a disproportionate amount of time rendering the physiognomies as if struggling to get a likeness. The brush marks lose their rhythm, awkwardly crowded into too small an area. It is particularly noticeable in those cases where harsh touches of black, showing the tracks of the bristles, follow the bony structures of the head and disturb the continuity of modelling of the skin’s surface. This contrasts with the technique used in the rest of the painting, which is assured and dynamic, amounting to an obvious aesthetic disunity. Such works contain both beauty and ugliness. Goya did not render all his subjects this way. 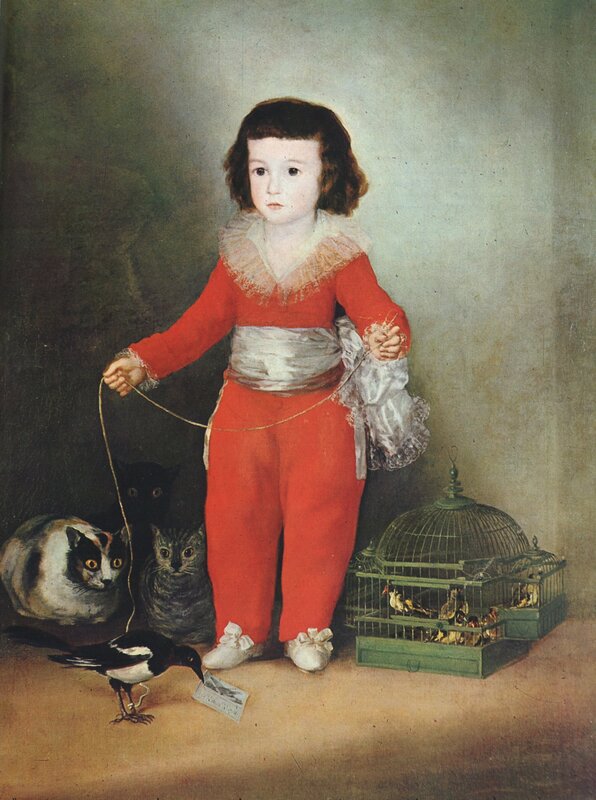 The infant complexion of the four-year old Manuel Osorio Manrique de Zuniga (1788) is shown almost devoid of shadow, offset against the dark of the hair, itself standing out against an atmospherically illuminated backdrop, which merges with his semi-transparent lace collar. 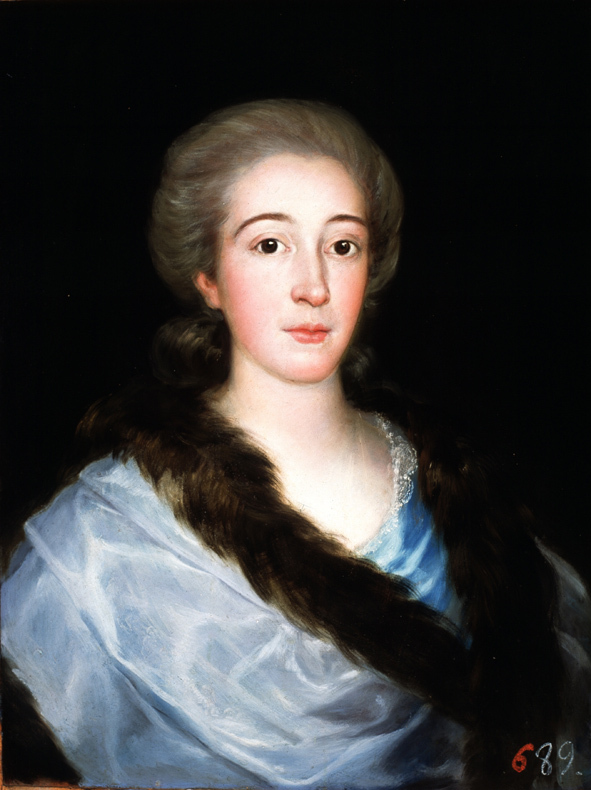 The skin of Maria Teresa de Vallabriga y Rozas (1783), under a strong light, appears even more stunningly flawless and is effulgently celebrated by the painter with the minimum of tonal intrusion. The obvious observation is that these two portraits show people who are young while those in most of the other pictures are older. That can be interpreted as Goya reflecting on the ageing process in a series of works he began at 37 and continued till he was 81. But it seems he is making a slightly different point. He depicts the faces of his subjects as marked or unmarked by experience, altering his painting method to accommodate this insight at the expense of technical and aesthetic pictorial unity. Unlike ageing, which has its poignancy, Goya in many of his portraits, is putting forward a strong, positive case for experience. He does not treat his sitters as victims, who have undergone something gruelling and damaging, but rather individuals whose experiences valorise and define them as characters. They have made themselves who they are and their faces show not their rank or their feelings, but their identity. The struggle Goya engages in is to record this identity and give it priority over achieving a likeness or making a unified painting. The positive account of experience in these works contains the idea of knowledge or skills developed as a result of actual observation of, or practical acquaintance with, facts or events, over a period of time. The faces belong to individuals who have learned something from their encounters with the circumstances of the secular world. They have dealt with this world successfully, and defined themselves in relation to this success. Using his touches of Spanish black, Goya maps out the marks of this experience on their countenances, avoiding the temptation to aestheticise their appearance in the way an English painter of the same epoch would have done. For Goya and his friends, the emphasis on the individual and the importance of experience in the formation of the individual, was so urgent that it demanded that the painting accommodate it explicitly, but in a limited location. The pictorial territory beyond the face was not under the same obligation. Clothing and objects are brushed in with a peculiar mixture of abandon and precision, creating what seem to be like painting ‘events’ addressed to the retina, which spontaneously give rise to phenomenologically convincing, but non-tactile, versions of silk and lace and velvet. It’s this aspect of Goya’s paintings that relate to the other definition of experience of interest to a modern audience. The pictorial ‘events’ are turned into versions of materials by virtue of the viewer actively filling in the gaps that Goya strategically leaves. Fabrics, accessories, props coalesce and appear only when looked at. They are accessible to eyesight alone, not open to verification by touch, nor taking up quasi-sculptural residence in the paintings. And however long the paint’s been there, the silk or lace or velvet are always seen in the present, by a live viewer. This work is never over because each individual viewer keeps it going, moment to moment. So looking at a Goya is a permanently contemporary cognitive experience. This is not unlike what is often described as a key component in encounters with modernist art, the viewers’ experience of ‘presentness’, of in-the-moment conviction in front of the work of art. At another level it is also a strong argument for painting as a medium, which is able to communicate powerfully by omitting information, keeping what it has elided available for a particularly constructive type of visual interrogation. When what was created by this omission appears, like the silk, lace or velvet, there is a thrill, rewarding the viewer for successfully doing the work the painter has left for them to accomplish. In painting, of course, the constitutional omission was the third dimension. As soon as that was excluded however, for most painters and viewers, the thrill of seeing space ‘appear’ became irresistible and formed the basis for the contract that existed between painter and viewer for a long time. Painters used the apparent space to build a series of varied pictorial worlds; then Manet omitted the half-tone, reducing the quantity of apparent space the viewer needed to infer in order to appreciate the painting. By limiting the thrill of deep space and the pull of the vanishing point, and confining the pictorial events to the foreground, Manet hoped to provide another kind of thrill to offset the loss of depth. With strict abstraction, the outside world was excluded from the pictorial world, but the thrill of apparent space often remained. In Kandinsky and Pollock, space appears intensified, as though the single vanishing point had been multiplied and distributed all over the pictorial field. Later, in high modernist examples, ‘optical’ space is equally apparent, but the contribution required of the viewer to see this space is different. The elements that are there in such paintings, chromatically active areas or patches, have to generate something that’s both visible and yet not there. Confronted with the colours, the viewer has to work to see the ‘space’, like the silk, lace and velvet, in the present. In planar abstraction, Newman is the obvious example, rather than being a dull fact, flatness is constructed and maintained in the context of the long-standing contract that rewards the viewer with apparent space. Given the Western pictorial tradition, the exclusion of a spatial thrill where one would have expected one means flatness can be experienced in the present as a felt resistance to such expectations. By contrast, Islamic art, which has no such contract with its viewers, is flat, but its flatness is not experienced in the same way. Like any modernist, Goya is playing to the strengths of the medium, particularly in respect of surface construction. It has to accommodate both thin washes and impasto touches of pigment and keep them separate and in a slightly unstable state that allows them to productively interact. Without these gaps the eye would have no entry point but simply bounce off a fully realised image sealed inside a continuous two-dimensional sheet of numbness. While the passages relating to fabrics in Goya’s portraits seem to produce a contemporary experience that the modernist audience should recognise, the pursuit of identity in his treatment of faces is more difficult to absorb into the current agenda. The discomfort caused by the countenances may show that the parameters of our taste have narrowed a little too much. Maybe the unacknowledged preference for belle peinture, the promotion of Braque’s Apollonian virtues over Picasso’s flirtations with monstrosity, has made even the hint of ugliness inappropriate. On the other hand, a good deal of the force in the portraits comes from the anti-aesthetic rendering through which character is depicted, and their faces do seem to have the power to disturb. It seems to me that the emphatic legibility of each individual person in Goya’s portraits is motivated by the ‘identity politics’ of the Enlightenment. The figure Goya projects is of a ‘modern’, self determining, rational individual, free of religious or state tyranny, creating their singular identity out of direct experience of this world, and relating to others on the same terms. Nearly two hundred years later, at what is surely a historical moment when the lethal power of religious belief has reasserted itself, this exhibition allows us to reflect on the current cultural influence of the system of secular tenets and values of the movement that dominated European thought in the 18th Century. The first problem is that the figure that each of Goya’s sitters individually instantiates presents a notion of the human subject that has turned out to be untenable under 20th/21st century philosophical conditions. Given the systematic elusiveness of the self, what now counts as identity tends to be fluid and mutable, and does not lend itself to delineation. Individuality is currently expressed more in terms of membership of a group or demographic with whom one shares characteristics and this change seems to be a sure sign that the Enlightenment project has run its course. Modernism, which is often associated with individualism – the autonomous, usually male agent, working alone and grappling with the problems of history and self-expression – has similarly had its day. But at that point we might consider another series of portraits, recently published in the newspapers, of the 130 individuals murdered in the Paris shootings, their faces mostly unmarked by experience. The events of November 2015 vouchsafed us a glimpse into what a non-theoretical post-Enlightenment world would actually look like, and perhaps make us think that the contested 18th Century project should be continued, in a spirit of solidarity with the dead, at least for the foreseeable future. It would be a pity if Goya’s people, visiting our contemporary culture, should end up looking more at home in modernity than we do. Let me be the first to say that this is avery thought provoking piece. I can take it almost all the way, except for two things. I do not really see the dichotomy you speak of. 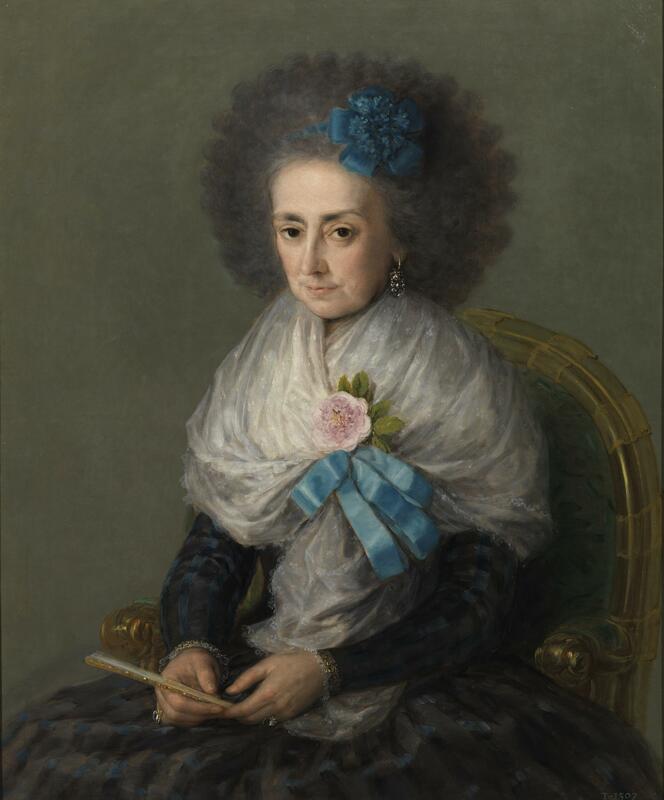 I see no harsh black lines or brush strokes in the features of Maria Antonia Gonzaga, above. I see no essential difference between Gainsborough’s brilliant portrait of his wife in the Courtauld Gallery and the equally brilliant Goya. Gainsborough – 1727-88. Goya – 1746- 1828. Who admired who the most?. Secondly, the Enlightenment project has bee buried time and again, with Dada, surrealism, post world war pessimism and irony of existentialism, post-structuralism, and by Goya himselflf, but it keeps bouncing back. It is no more over than modernism. You are trying to be trendy with that trial kite. otherwise, very well said. P.S. The concept of the individual is still “perniciously lively” in popular culture and generally. Have you not been to the B. P. Portrait awards or the Taylor/Wessing photo-portrait awards at the Nat. portrait Gallery? The only thing that is missing is a painter great enough to make a great picture out of this sporting of individuality. Being a great admirer of Goya, both of his paintings, but also and not least his drawings and etchings, wherein he almost unfailingly brings about a magical wholeness (the album of “Witches and Old Women” at the Courtauld last year had some brilliant examples http://www.port-magazine.com/art-photography/the-old-masters-monsters-goyas-private-sketches/ ), I was rather disappointed by the discrepancy in handling between the faces and the drapery/furniture referred to here by David, and strikingly so in the “Portrait of Doña Antonia Zárate”. It seemed to me to introduce quite a marked ambiguity to the work. I thought at the time, rather irrationally, that painting thus awaited the arrival of Cezanne to be the one to paint a face in the same disinterested manner as a sofa or a curtain (or an apple) and thereby bring about unity – for the sake of the painting, if at the expense of the “individual” identity of the sitter. http://www.wga.hu/html_m/c/cezanne/2/4portra1.html That’s a crude idea, and I’ve come to distrust that (modernist?) sense of wholeness a little, whilst still craving it. P.P.S. The difference of treatments in the Goya is much less apparent in reproduction. Some of the portraits in this show, whilst being very cleverly painted, had an awkwardness to them which I didn’t find so much distracting as fascinating. The different handling of fabric etc compared to skin, highlights the amazing skill Goya had of conveying a sense of a real person with life force. I suppose I looked at the paint textures in the clothing and backdrops with different eyes but I personally enjoyed the contrast. Please put up the Gainsborough portrait from the Courtauld. OK. The Gainsborough is more kindly, but it is his wife after all. It’s also probably slightly a better painting, but only just, than the Gonzaga, I mean. It is inevitable that in a portrait the delineation of the features will require more concentrated effort than the clothing. that’s the only difference I can see. Just looking at one feature common to both the Gonzaga portrait and that of Mrs Gainsborough it seems to me that Gainsborough has squeezed considerably more pictorial mileage with what he does with his good lady wife’s hands compared with what Goya does with those of The Marquesa. Mrs Gainsborough’s hands add a great sense of the character of material over and above the straight visual rendering of it. Her left hand, clutches and lifts the dark blue over garment and imparts a real sense of the weighty fabric that surrounds her person. Meanwhile the index finger of her right hand partly disappears under the black lace thereby emphasising it’s extreme delicacy and lightness. In contrast the fan in Goya’s portrait looks like a rather pedestrian prop that serves only to give the Marquesa something to occupy her hands with. This is an excellent read full of insightful opinions – thank you David. I wanted to make a claim for the Goya (Gonzaga) over the painting of Gainsborough’s wife that Alan has made reference to. The way we regard Goya is often skewed by the final black paintings (which are really something, granted) or his extraordinary prints. But more than the drama or tone, he had the most remarkable ability to handle soft closely related delicate tints and frequently demonstrated a fantastic subtle nuancing of colour. To regard the aforementioned portraits: Compare the way the hair is rendered in each. In the Gainsborough, it looks generalised and summary when judged against the specifics of the Goya. That crescent of warmth on the right for example. Goya – like no other artist can also use blankness of area in the fullest of ways. (Manet clearly got so much from him in this regard). This is surely due to the colour relationships he made happen, which are always powerful and vital even at their most understated or emptied. My point is that Goya had a searing honesty in his painting which was realised ‘in the paint’ and was not dependent or even reliant upon the subject. Everything happened in the paint. The subject in figurative art is a vehicle for the art to happen (does the word ‘Art’ sound better than the phrase abstract content ?) Content depends upon the attempt to fully realise things in the medium chosen; Goya is so great because all his decision making comes through in that paint , with those colours. Gainsborough for me at least, relies on his technique more, so it feels more ‘generalised’ – not generalised in terms of a hairstyle, rather not really happening in the paint in the same way or not to the same degree perhaps – call it synthesis if you wish. That is not to say that Goya hit the bullseye every time – no artist can. It’s just the mindset is there. Either an artist works in this way or they don’t. I am getting more convinced that you can’t move from one mode to another either. When I hear or read remarks about ‘proportion’ as if it was some concept that needed to be understood before a painting (or sculpture) was undertaken – so we have this imaginary benchmark of form to judge the work against, it betrays an amateur at best; a sort of weird artistic eugenics sits at the far end of that troubling ego driven axis. If that’s your bag , stick to how to draw books, and make sure you keep a consistent light source in your painting. Goya, to me, seems to be an essential painter – one of the most essential of painters and this is why his work is highly relevant today. The last line of David’s article was an understated yet slightly chilling portent. I applaud him for saying that. I think you are splitting hairs there Emyr! I agree that the hair in the Gonzaga portrait is a marvel of detail, but it is not “in the paint” so much as in the amazing fine detail in the way it is drawn. But I can scarcely think of a portrait which is more “in the paint” than that particular Gainsborough, and it was that quality, call it technique if you must, that Goya admired so much. And as Susan Sontag says in her valedictory appendix to her Against Interpretation –” we live in a time which is experienced as the end –more exactly just past the end — of every ideal……Something was operating to make these marginal views ( of hers) more acceptable ……something that it would not be an exaggeration to call a sea-change in the whole culture, a transvaluation of values — for which there are many names. Barbarism is one name for what was taking over. Let’s use Nietzsche’s term: we had entered, really entered, the age of nihilism ….. what I didn’t understand ( I surely was not the right person to understand this) was that seriousness itself was in the early stages of losing credibility in the culture at large, and that some of the more transgressive art I was enjoying would reinforce frivolous, merely consumerist transgressions” . 1996 I.e. Fifty two years after Greenberg’s diagnosis, quoted in the Matisse comments. Secondly, a smaller point. Far from Braque’s intellectual subtleties being promoted over Picasso, the reverse has happened. Picasso’s iconoclasm has been used to sanction some of the worst artistic vandalism that post modern irony, it’s “chic cynicism”, “slick technocracy” and “parlour despair” (William J Curtis) has so far presented in the name of idiomatic innovation. Poor Braque’s “vraie peinture” has been utterly side-lined, unappreciated except for a very few connoisseurs and painters, but no one has been able to carry it forward as yet with anything approaching the subtlety of the originals. Eugenics! “Weird artistic eugenics.” I looked up “eugenics,” Emyr. It’s perfect! I’ll unravel the DNA of plasticity and the Studio School for you in a minute (in 25 words or less, I promise). First though, some facts: Adolf Hitler applied to the Studio School, but he was NOT accepted. Graham (G. Nickson, the dean) is quite fussy about who gets in: no Nazis. Graham’s been tricked though: Heidegger lectured at the school a couple of times. Francisco José de Goya y Lucientes did, of course, study at the Studio School. He worked in the Guston Studio, where Gainsborough had worked before him. Scholars have determined that Goya was very interested in some prints Gainsborough had left behind. And those Persian miniature painters Alan talked about in his Matisse/Baroness piece—they all got their MFAs from the Studio School. Alas, John Frederick Lewis flunked out. David talks about the mix of beauty and ugliness in Goya’s paintings. The faces of his subjects are marked or unmarked by experience: his painting method accommodates this insight at the expense of [I might insert the word “apparent” here] technical and aesthetic unity. Goya is putting forward a strong positive case for experience. His sitters are treated as individuals whose experiences valorize and define them as characters. I think all this might be applied to life-size figures Bruce Gagnier has been making recently. Those figures of Bruce’s aren’t wearing clothes—and I can’t go along with all David has to say about the clothing in Goya. Also, obviously, I can’t go along with the point about the human subject being untenable under 20th/21st century philosophical conditions. That sounds like The New York Times, like Jerry Saltz. I have a whole lot more confidence in Alan Gouk. Alan talks about the kindliness the Gainsborough portrait. The Cezanne portrait Robin brings up was in New York not long ago—part of a great exhibition of almost all Cezanne’s portraits of his wife. In the catalog for the Cezanne show, the curators ask the question, Did Cezanne love his wife? Not a very cool question to ask today. I wasn’t convinced by the curators’ answers, but I’m glad they asked. Love is an interesting “concept.” It’s “abstract.” It’s “human.” And it has something to do with knowledge—at least in the context of portrait paintings. It seems to me there’s an important difference between the kind of knowledge/love embodied in the Gainsborough portrait and the kind of knowledge/love embodied in the work of Goya, Cezanne and Gagnier. 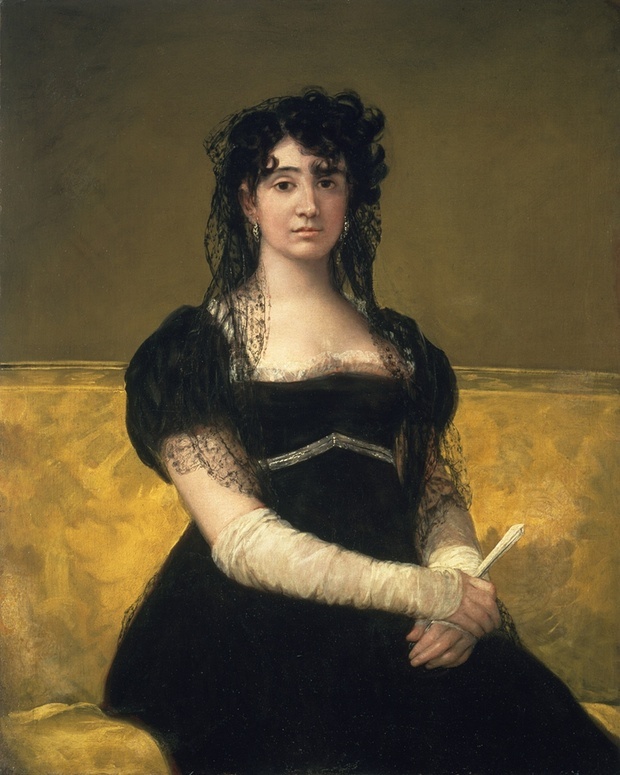 I think Noella James gets at something very important when she talks about the Goya portraits as being very cleverly painted, but awkward in a way she found less distracting, more fascinating. Maybe today all of us look at figurative art as we might look at a photograph. Often we find figurative paintings or sculpture “awkward.” Sometimes the “awkwardness” is just silly. Sometimes it’s “fascinating” though. I think the Goyas are fascinating because of Goya’s powerful plastic consciousness. I feel I can put my hand around every volume in the Gonzaga portrait. When I put my right hand on the left (Gonzaga’s left) half of her wrap, I can feel my right arm being pulled into the painting. When I put my left hand on the right (Gonzaga’s right) half of the wrap, my arm is pushed out of the painting. All the volumes are solid as rocks. That fan, Terry, might be a piece of steel in one of Robin’s sculptures. It’s not a pedestrian prop—not anymore than Robin’s steel is literally scrap steel. The fan, like Robin’s steel, has a special plastic reality. Maybe Gonzaga’s waist is no wider than one of her arms. Where are her shoulders? Doesn’t matter: the volumes are more real than anatomy. Note: I can grip all the volumes: this is different from just touching them/responding to textures. And, of course, Alan might disagree with me about color. Emyr, you might think I’m kidding around. Andrew Forge, another Englishman, thought this was a kind of crazy way of talking about drawing/painting/sculpture, but he admitted he didn’t have a better way. He knew there were “rules.” Plastic consciousnesses rule in painting. “Decisions” are driven by plastic consciousnesses—and by other things (things like experience)—AS painters paint—but paint is just mud: paint doesn’t make decisions. When Titian was at the Studio School, he was always fighting with those guys from Florence. Good fights! One final thing: I have to disagree with Alan about the audience for modernism: there IS an audience for modernism, and for Alan Gouk, and for Abcrit and the Brancaster Chronicles: it’s at the New York Studio School! Bruce Gagnier’s rather distasteful distortions are symptomatic of why it seems nigh on impossible to make outstanding figurative art now. The plastic and spatial content of the body/figure appears to be exhausted (in sculpture it never had a great many options), so the psychological/human content has to be twisted into grotesquery for “artistic” effect. The last person to successfully pull the human figure around spatially in such a structurally disrespectful manner without straying towards this kind of monstrosity was Picasso (in his late paintings), but we won’t see the likes of that again. Robin, (as usual) you’re looking at figurative art with your Literal Glasses. Put on your Plastic Glasses! You’ve got a “plastic consciousness.” I know that’s a kind of horrible phrase, but at least it tries to say something different from the words that are familiar, word that almost get in the way of looking at art: “technique,” for example, a favorite of Peter Schjeldahl. You talk about distortion. Distortion from what—from a literal/photographic way of looking? Plasticity—spatiality, call it what you want—is NOT a property of human bodies! It’s a property of paintings and sculpture. And it’s not an ““artistic” effect”—though it might seem so if you’re blinded by literalness. It’s just the way things are. I see Mozart in Bruce’s sculpture. Also (maybe interestingly) I think in might have just prints (NOT by Gainsborough) of Gainsboroughs that Goya responeded to. Running off to work. . .
Once again Robin, you reveal your dilemma. You cannot define what it is you like about the Constable portrait without pointing up features that lead directly to the French line of Corot, Courbet, Manet, Cezanne, Van Gogh, etc., the foundation of the modernist sensibility, Proto-modernism if you like. 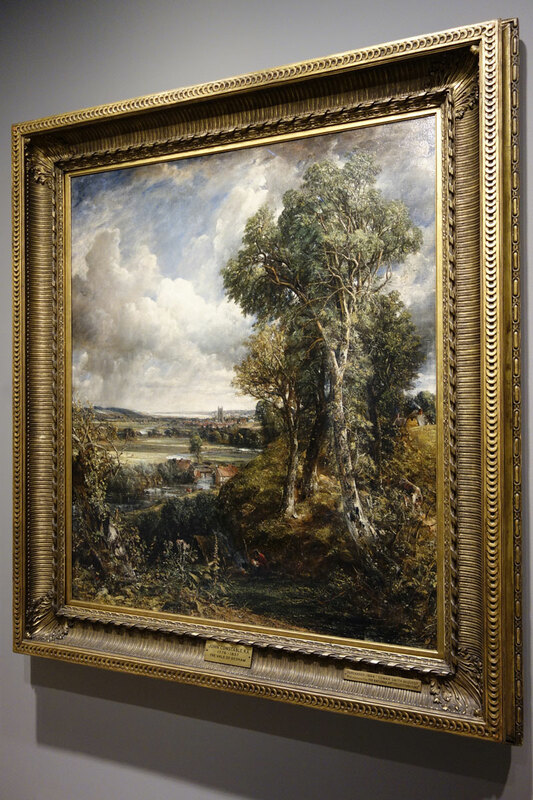 “In the paint” is the way Emyr rightly describes it, and with a new probity of techniqueless directness, which is what makes Constable’s sketches so “modern”. 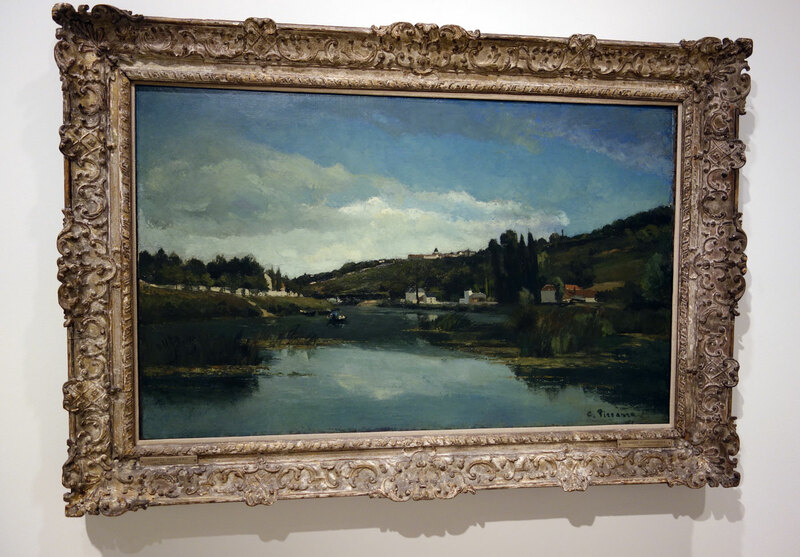 So, does modernism begin with Constable, rather than with Manet/Monet ?. Well, I’ll try. The Constable is freer, fresher and. yes, more “in the paint” (and “in the moment”) than Gainsborough ever once managed; but also, in the articulation of the head, more spatial. And yes, I agree Constable is at the beginning of what I admire in “the French Line”. But here’s the surprise – I’m not a big fan of Constable’s “sketches” – by which I presume you mean the small studies of clouds etc. – and I’m certainly not a fan at all of the actual sketches – the full size preparatory “impressionistic” paintings for the “six-footers” – which I find almost always ponderous and inneffective. No, it is the finished six-footers themselves in all their glorious detail that I think are amongst the greatest paintings ever, in construct and overall coherence, and in a total resolution of horizontal distance with two-dimensional organisation that compresses earth and sky into a wholeness matched by very few. The “modernist sensibility” can go hang. “In the paint” is a phrase that’s new to me. I apparently wrongly connected it to “thinking”/talk about “materiality” that’s fashionable now—and that doesn’t mean that much to me. If I understand Alan correctly, “in the paint,” for Emyr and maybe for all of England (??? ), means something close to painting alla prima. Maybe, insofar as painting alla prima might be thought of as a technique, something even “freer.” Conservators be damned! That’s fine with me. At the Studio School (I keep referring to the Studio School because I want to be clear: nothing I say here is “original:” I’ve never had an “original” thought: I just listen to people smarter than I am—also please recognize that nobody agrees with anybody about anything at the Studio School: blame only me for the way I’m garbling the thought of a whole bunch of really smart people), we use the word “sketch” in a similar way. “Sketch” doesn’t mean a preparatory study. A sketch is a drawing, painting, or sculpture that can be completely changed/“turned upside down” in “a moment”/“a flash.” It is a modern “idea,” understood by the “line” of French painters Alan is so attached to, and by Constable (are those “finished” six-footers really finished? )—but it’s an “idea” Leonardo understood too. Robin’s biggest sculpture might be considered a sketch at the Studio School, a sketch in the same sense that a Giacometti bust might be considered a sketch. A big painting by Alan might be a sketch, in the Studio School sense of the word, just the way a painting by Morandi might be a sketch. A sketch allows a modern artist to keep looking, not to be trapped by ideas about finish, technique, or style. I took Robin’s Constable portrait into school with me today. I showed it to Georges Braque. Guess what he said. He said, “That head’s too damn big! It’s a nice Rembrandtian, very “spatial” head—but you can’t put a head like that way up on the picture plane—or if you do, you’ve got to flatten it the way Cezanne did.” Then he went on and on about the plastic consciousness. Braque said he’d read David’s piece on Goya. He liked what David had to say about experience—and, surprise, surprise, he thought it applied to Bruce Gagnier’s work too. He said both Alan’s Gainsborough and Robin’s Constable were slight/shallow—both in terms of human experience and plastic integrity—but they were nice paintings. He told me not to get hung up on subject matter, to compare the Goya portraits with Constable’s landscapes (the six-footers): there you’ll find depth of human experience and matching plastic integrity. “In the paint” is a phrase I used to try to define the difference between the expressiveness of the painting and its subject. I can find an analogy to define my phrase perhaps: if you imagine two compressing forces (maybe your hands holding a piece of paper) pressing against one another with the paper in between. One can represent the subject, the other the technique. If one hand presses too much the subject leads , if the other does, it’s the technique. There’s an electricity in that membrane (surface) / paper in this analogy. The greater the compressive forces the more the electricity. The ‘subject’ is a figurative construct , and in abstract painting it would be the relational elements , neither should be dependent upon a priori forms or even allusions to gain their expressiveness. That Goya maintains an equilibrium which allows the subject to come through the paint; the Gainsborough seems to fluctuate between subject and technique – I don’t feel the same ‘charge’ from it – for me anyway. (I will temper this though, by saying this reaction is basely solely on screen reproduction – and indeed I will go and see them). Emyr, I think I understand what you call “equilibrium” in Goya. “Good”/“real” art just happens. Nothing is forced—yet there’s always something about it that’s more than what meets the eye. A Russian friend (his English isn’t perfect, but it’s “perfect”) once kind of dismissed a Gaston Lachaise figure as “too conscious.” I think we might agree those words work for Alan’s Gainsborough. I can’t really follow you when you talk about dependence on a priori forms. It seems to me you can’t avoid “a priori forms.” And that’s not a big deal. Of course, it has been a very big deal to avoid any kind of dependence on the figure for a long time now—but that “deal” is beginning to feel kind of dated, more and more dated everyday. Maybe Tony Cragg and Richard Deacon started out trying to avoid a priori forms, but look where they are now. It seems to me (and, incidently, to Bruce Gagnier too) that Robin’s work has always had a very healthy “dependence” on “classical” abstract art, on Caro, Smith, Kandinsky. (It’s Bruce who insists on the Kandinsky connection. I think Bruce has a very good eye. Robin might prefer to be connected to Constable though.) That “classical” work is not “enough” for Robin. It doesn’t “say” what he has to “say”—and so he rips it apart. Bruce is “dependent” upon “classical” figure sculpture in more/less the same way. It doesn’t “work” for Bruce: he has to rip it apart. One thing’s for sure: it’s not easy talking about art. We’ll blow me down, Robin! And here was me thinking you were trying to imitate Constable’s sketches for his six footers in your recent paintings. Funnily enough, I began writing about Gainsborough some years ago, after the last big show at Tate Britain, but had to give it up as it required comparisons with both Jacques Louis David, and Goya, with paintings that were scattered all round the world. Now, with the touch of a finger, one can at least have some idea of what would be revealed. It is not good enough to talk of bourgeois aggrandisement. Gainsborough is much better than that. Check out Portrait of George Venables Vernon 1767 (Southampton Art Gallery), Carl Friederich Abel with Viola da Gamba, ( the version with dog) 1777, or William Wollaston (with flute) 1757. And compare with Goya’s Charles IV in Hunting Dress 1799, (Palacio Real Madrid), and Ferdinand VII in Court Dress 1814-15. There is a particularly fine set of images onARTBLART.com, from the National Gallery Goya show, which unfortunately I did not see. And for David (forget TJClark), his early portrait of his mother-in-law, Madame Pecoul 1784, and the portrait of Madame Francois Buron 1769, the version holding a book, (Art Institute of Chicago) , show what might have been if events and history had not intervened. The latter especially shows the dawning of that new vividness of light and colour which was beginning to announce the modern period, and there are hints of it in Goya too, even with his darker psychology thrown in. P.S. The 1765 Portrait of Carl Friedrich Abel is also very fine. PPS. The most difficult thing in portraiture is to paint the head absolutely front on, and in this Gainsborough is a master. Check out the Portrait of Mrs Elisabeth Edgar, Half -length, Wearing a blue dress, from Sotheby’s London 2014. And for psychology, Mrs Philip Dupont, Gage Academy –Seattle, Washington. Hypothetically speaking Jock: If Gainsborough were alive today, do you think he would still be a figurative painter? How about Goya? Also, can one distinguish certain artists as good at depiction and others as good at painting – even if they too are depicting? Is it possible to separate things like that? Art that depicts would seem to lend itself to judgements that are able to be measured in the quality of depiction against a known subject: Is that head too big? Are those eyes in the correct place for the form of the skull and so on. These mechanics of the figure and its position in space have underpinned discourse and teaching for ever. It’s an approach which encourages looking and structural enquiry. Is there something missing in that though? A child at 3 will struggle to draw a triangle on a regular piece of paper – those diagonals are aggressive forces. We seem to have an inherent ability to see the facts of the shape of the paper and relate our lines to it. (Matisse ‘the first line is the fifth’). We develop or perhaps acquire abilities to see rectangles as fictive spaces – our built environment is dominated by 90º angles and windows – and now – digital screens into virtual worlds. Are we being conditioned to see in compositional or pictorial ways? As an aside have you noticed how many people (of all ages now) use the phrase ‘it was like’ or ‘I was like’? ; the latter has replaced ‘I said’; as if the speaker is inviting the listener to view an imagined scene. Is this a consequence of our digital world too or just a quirk of language? Images and entertainment are dominant ways of communicating. I am not really lamenting this state of affairs – it’s simply the playing field we find ourselves on. We have to get on and play on our own terms. Goya seldom played by the rules so I don’t think we need to impose any on his work. Goya IS alive today. Even though I didn’t see the portraits show, Maria Antonia Gonzaga has been very much a part of my life ever since David’s piece came out. Alan Gouk is breathing life into Gainsborough. About depiction: let me refer you to Michael Podro’s little book called just that: “Depiction.” I just got my copy off the shelf. It’s full of underlining. I can’t remember a thing Podro says though. I might just drop everything now, and read it again: it looks very good. I know “plastic consciousness” is a horrible phrase. It might sound completely foreign, but I think you already understand it. You say, “We seem to have an inherent ability to see the facts of the shape of the paper and relate our lines to it.” I first heard that business about the first four lines of a drawing being the edges of the piece of paper you’re working on from a guy named Nic Carone. He’d heard it from Hans Hofmann. I wouldn’t be surprised if Hofmann got it from Matisse. Anyway, YES, YES, YES. And the middle of the rectangle is deeper in space than the edges: that’s why most portrait heads are in the middle (not the exact center: the exact center is “dead”). This is the way human beings see, the way we’ve looked at things from the beginning of time. Bad schools try to get you to forget this, to “teach” you to look at things in “new” ways. It seems to me “rules” come from bad schools: schools that teach drawing is over—drawing the figure is over, etc. You’re not allowed to do this or that TODAY. Good schools try to put students in touch with what’s “real,” what’s “human,” what’s “alive.” There’s lots that is “unreal” about the world we live in. Andy Warhol understood that, but Goya understood it better. You ask about there being “something missing” in bad academic work. That’s the important question, it seems to me. Obviously bad academic work is empty—but what about Caro? What about Goya? For Robin there’s something missing in Caro. For Bruce Gagnier there’s something missing in Goya. They’re trying to find what’s missing. That’s your job too! I think the problem we have is in believing that an English painter can be “as good as” the great Spanish Goya. Perhaps through over familiarity, we tend not really to look at the Gainsborough’s, except when forced to do so by a major grouping such as at Tate Britain , how long ago now? But I am confident that the two Abel portraits, with Viola da Gamba would stand up well if seen directly beside similar Goya subjects. Compare The Honourable Mrs Graham, 1777, ( Nat. gall. Of Scotland )with The Marquesa de Pontejos (Mellon Coll. Washington , 1785-90. It seems to me that the Gainsborough looks fresher, more “modern” than the Goya, though painted earlier, and the “technique” envied by Goya. Try Lady Alston 1760-65, (the Louvre), Lady Innes 1757 (the Frick) , the amazingly fresh sketch for the portrait of Admiral, the 1st Lord Rodney 1782 (Gladwell and Patterson) , The 4th Duke of Argyll (Nat. Portrait Gallery, London) , and the two late portraits, of Mrs Hallett 1788 (Philip Mould Ltd.) and Lady Bate Dudley 1787, stunning examples of his late style, technical wizardry and all. Of course Goya has qualities that perhaps penetrate further, with what we now call irony, but let’s not forget that Gainsborough’s powers of character portrayal are considerable in those I have listed earlier, and that he did do it first. I do see your point and am grateful for the examples here and will have a look. I had never considered Gainsborough much in the grand scheme of things. Goya though has been a constant reference for me: The Prado etc…The prints are staggering and like much of the paintings, they often have a stillness. He worked very spontaneously for long periods of time and that working through things ‘in the paint’ (again) is very telling. I read he didn’t rate Delacroix apparently when towards the end of his life he saw some in Paris. I suspect they both used mannequins or dolls for preliminary stages of the female portraits, but Gainsborough overcame the consequent stiffness better than Goya did. There remains the question of what he saw or knew of Gainsborough, but on his own testimony he was an admirer. I’m going to retract the “slightly” and the “bourgeois” and go for “very meretricious and sentimental piece of virtuoso aristocratic aggrandisement”. Gainsborough was definitely very accomplished but Goya has ‘duende’ , as the Spanish might say. Your animus is beginning to play you false. You wouldn’t want to sound any more like Peter Fuller and TJ Clark than you already do, would you?. But I’m out. Well, it’s not animus; sarcasm, perhaps. You’re doing a good impersonation of Brian Sewell. Robin, I know you’re NOT some macho hooligan from the ‘70s, a guy who can weld steel with his bare hands—and who is absolutely terrified of any kind of figurative art—but you sure do sound like one in this post. I think it’s great that David’s response to the Goya show appears at Abcrit. I think of Goya as a very “abstract” artist. It seems to me there is plenty of continuity between figurative and abstract painting and sculpture. Yes, early in the 20th century a bunch of people—maybe the Russian constructivists are the best example—made very pure (abstract art that tried to break decisively with figurative art) abstract art: they believed a new world was about to dawn. The new world failed to dawn. People continue to make art that mixes “abstract” principles with figurative imagery to one degree or another. That’s what human beings do: that’s all they can do (it seems to me). You know all this. Yet you appeal to “connoisseurs” (you’re not a “connoisseur:” you’re a tough GUY!) to answer preposterous questions: “Talking about figurative sculpture’s nuances of technique would be nigh on ludicrous, wouldn’t it? In fact, talking about portraiture in sculpture – at all – would be pretty weird and pointless.” I have no idea what you’re talking about when you talk about “technical wizardry.” I can’t imagine what you’re talking about when you dismiss portraiture in sculpture. David Sweet had some very interesting things to say about experience, about the way character/identity is formed in Goya’s paintings. Can you not see what he said as relevant to abstract painting and sculpture? Do you really think it’s trivial, stupid—not worth “reappropriating”? It’s not about technique. It’s about vision. Gainsborough, David and Goya each has a different vision, or concept, if you like, of what it is fitting for the advanced painting of their time to be engaged with, and, as I have said, it involves a, for them, a new clarity and vividness of natural light ,as they were able to experience it. Nothing has changed in that respect for our time, but I have explained the continuum question at length in the Matisse comments. As to the last question, –No, all this has virtually no relevance for sculpture at all, except that sculpture too stands in light, is illuminated by light, and needs to take that into account, especially when it comes to exhibiting. It was only in the Baroque period that portraiture in sculpture took on the pictorial. There is plenty of great portraiture in sculpture — just one example –the Nok , Ife, and Benin heads. Relevant for abstract Sculptur — you decide!. But I said I am out, and so I am. Good luck with other answerers. That’s too much contextualising for me. What I know for sure is that looking at Lady Bate Dudley of 1787 gives me a very similar queasy feeling to looking at a lot of bad abstract painting. In fact, it’s an identical feeling – gratuitous bravura technique, no content; painting about nothing; academicism disguised by flash surface. Are we intent upon reappropriating this? Isn’t this just what Cezanne, Pissarro, Matisse smashed down? BTW. I’ve just come in from the golf course, where the March hares are gambolling (just fed you a line there–boom boom) , and the skylarks are singing already. What’s it like down in the old smoke? Any more for the skylark! Over and out. I can’t resist one more comparison, just noticed. On artblart.com by Dr Marcus Bunyan there is a photographic sequence of a show on now at the Gallery of New South Wales, Sydney. 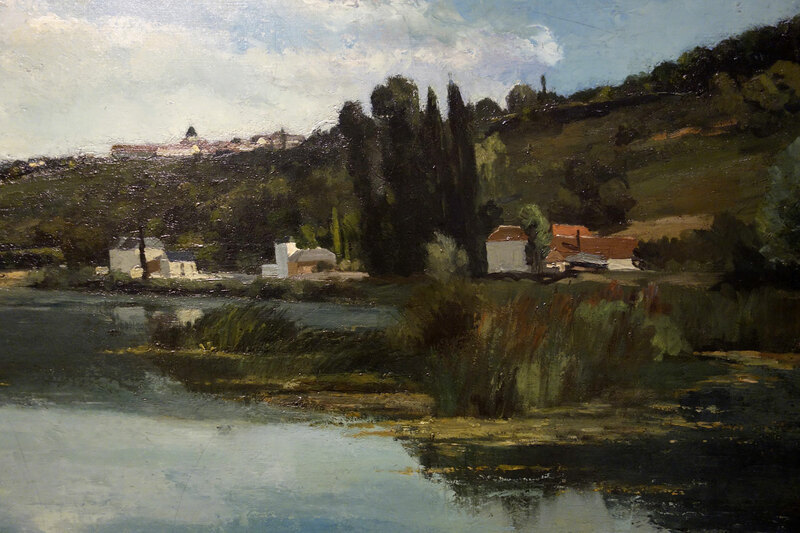 Take a look at three details, one of Gainsborough’s 4th Duke of Argyll, one of a Constable landscape detail, and one of Pissarro’s The Banks of the Marne. I rest my case. Instead of being sarcastic about Lady Bate Dudley, one of G’s last and most flamboyant pictures, look at the form-creating “handling” in the Argyll picture, worthy to stand beside any of the great Venetian, Dutch or French masters!. That Constable is a great painting. Neither the Gainsborough nor the Pissarro landscapes are anything like a match for it (I have seen them all). And no I don’t much care for the the 4th Duke. Each to his own. Please reproduce the three details. How you getting on with the inflatable abstract art mannequin, Alan? Can’t figure out how to tie this “comment”/“reply” to your yes/no comment/reply, Robin—but: Good! We understand each other (to some extent). But don’t be shy! Feel free to talk about figurative sculpture’s nuances of technique, and what they might have to do with experience: it might help Alan with his mannequin project. BTW I once played golf in Scotland! Grandparents on my father’s side were both from Scotland. What a country! March hares. . .
that was the point I was making with the Rembrandt comparisons over in the Matisse comments. A thousand other considerations play a part…. because the illusion of space is just that — an illusion, calling for a leap of imagination on the part of the observer. The Baroque period is exceptional , anomalous in that respect. Since then painters have increasingly favoured bringing the protagonists close up to the surface — we saw this in the Bellini, Poussin, Rembrandt, Goya and on into 19th century France. Why? Because bringing forms up close allows them to be experienced as somehow more “real” more actual, more present to the eye, more savourable, tactile almost, but not quite. Finally, if you can’t see how marvellous a painting the 4th Duke is, there’s nothing I can say. And the terms you used to describe the Lady Bate Dudley, and I don’t know what abstraction you can be thinking of, are somewhat hysterical. Of course it is over the top virtuosic, but only a great painter could afford to let himself rip in that way, and damn the consequences. Many of the joys of art in any medium, music included would never have happened if restraint held them back. Superabundance is in short supply, so we should praise it when it does arise. The 4th Duke is marvellously painted, the clothing seems more alive than the man himself and maybe this is a reflection of his state of mind or health? There has to be an element of psychological tension or expression within a good portrait, I think, if it is a portrait rather than just a painting of a person. Goya’s portraits do have that intensity I feel. Yes, Noella, I bet the 4th Duke is marvelously painted—and isn’t it somehow liberating to start to take Gainsborough seriously? I’m beginning to figure out why I blew up at Robin yesterday. It wasn’t just because he called me a connoisseur. It’s because he refuses to accept that all paintings (and sculptures) are golf courses: they’re containers for March hares and skylarks, for the human spirit, human experience. I know Mark Skilton is going to say, “There are no golf balls in my sculptures. They just aren’t there!” But they are—and it might be a good idea to pay attention to which ones are Titlests, which ones Spaldings. Maybe we’re all—those of us of a certain age anyway—kind of trapped in the ‘60s or ‘70s: maybe we’re too worried about making “great” paintings or sculpture. We jump too quickly to thinking about how “great” a painting might be. We don’t give enough time to thinking about the human experience the painting might contain: how “true” that human experience might be. Gainsborough’s flamboyance, his excessiveness is certainly human. He’s a pretty good abstract artist too: he knows where to put his heads in his rectangles! Of course, all this can be “debated”—but simple declarations of greatness or not-greatness aren’t debate: they cut off debate—except, of course, when they provoke debate. . . I was at the Courtauld yesterday to see the fantastic, brilliant, marvellous Botticelli illustrations to Dante’s Divine Comedy. Never mind the V&A Botticelli circus, go to this one, it’s stunning (I know, that’s not very erudite analysis either. You can at the same time see a little show of drawings by Bruegel and others, including someone called “The Master of the Mountain Landscapes” whose drawings are a match for the best of Van Gogh’s). I also looked at the room with half a dozen Gainsboroughs down one side and half a dozen Constables down the other. Sorry Alan, not even in the same league. The only Gainsboroughs of interest were in a side room – the one I’ve always had a liking for, Mr. & Mrs. Andrews http://www.nationalgallery.org.uk/paintings/thomas-gainsborough-mr-and-mrs-andrews , despite its slightly cartoonish quality, which means it doesn’t stand prolonged looking; and the even better, Cornard Wood http://www.nationalgallery.org.uk/paintings/thomas-gainsborough-cornard-wood-near-sudbury-suffolk , which is a very early work (as is the Andrews picture) influenced by Ruisdael. That said, it really is very good indeed. But it is really the only rival to any of the main Constables. Gainsborough was obviously a very talented chap who progressively blew it as he got older. This http://www.nationalgallery.org.uk/paintings/thomas-gainsborough-mr-and-mrs-william-hallett-the-morning-walk and this http://www.nationalgallery.org.uk/paintings/thomas-gainsborough-mrs-siddons are by turns boring and confused. Show me anywhere in Constable’s work where the brushwork depiction becomes as repetitious and unconsidered as in the top left of the Hallett painting, a mindless virtuosity that runs amok throughout the work; or show me a JC painting as unfocussed or visually confused as the Siddons portrait. The Gainsborough Market Cart is not too terrible, but look how dull the conception of space is, and how those cloud formations repeat the trees. Now look at the magnificent variety of the sky in the Constable Hay Wain, and see how free and inventive he is right through the painting, from the smallest detail to the biggest distance. You may recall that the comparison I made was between the portraiture of Goya and Gainsborough, not between the landscapes of Gainsborough and Constable. And the best of Gainsborough’s portraits, the two Carl Friedrich Abels (with viola da gamba), and the 4th Duke of Argyll, are not comparable with a Constable landscape. They engage quite different pictorial priorities. The little Gainsborough landscape in the Sydney show, River Landscape with a view of a distant Village, was painted in 1748-50, eighty years earlier than the Vale of Dedham 1827-28. I am sure Constable would have liked it, and wished to take it further, which is what he did. 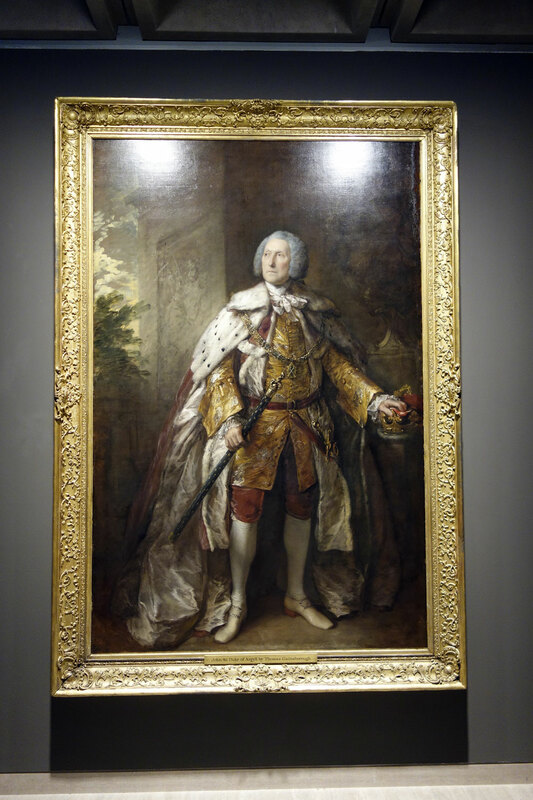 The detail of the 4th Duke shows how utterly inaccurate are your “mindless virtuosity that runs amok throughout the work” and “vague and wishy washy” as a description of Gainsborough at his best. 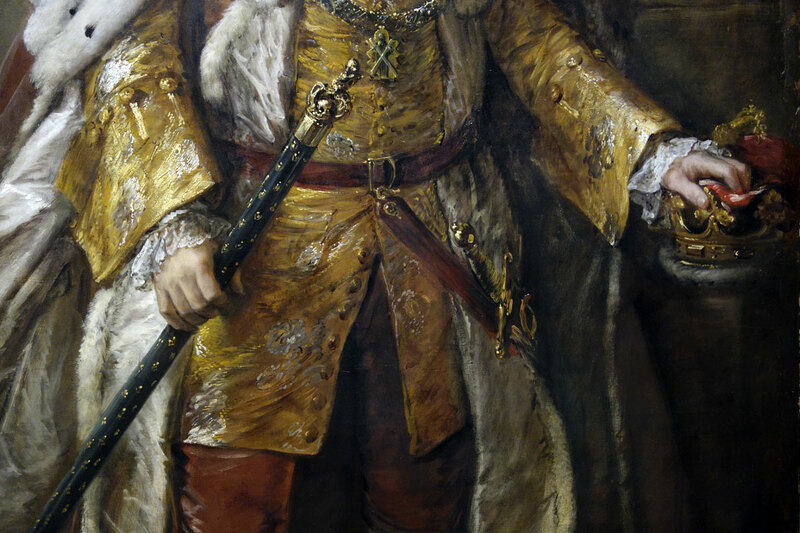 The fine detail of the hands inside their ruffled cuffs, the firm grasp they have on the objects they hold, the foreshortening of the arms in their resplendent uniform, the contrast between that uniform and the ermine cloak, and the brilliantly detailed features of the Duke himself, are all clear indications of a major talent. And his stance is comparable with some of the masters of this genre. It would be redundant to carry that forcefulness of delineation into the background of the picture. Velasquez , in his standing portraits , doesn’t do that either, nor does Goya. Why not put up the two Abel portraits to show him at his best! Try also the Huntingdon Library’s portraits of Edward 2nd Viscount Ligonier (with horse) , and Lady Ligonier, 1770. Gainsborough has more in common with Claude Lorraine, Watteau, and 18th century France, than he does with post-Romantic, post Revolutionary England. That has to be borne in mind when essaying comparisons. This Velasquez makes an interesting comparison with the Goya of Manuel Osorio etc . Maybe it is the Spanish element. Stronger light will provide a more heady atmosphere for dealing with colour – both Spanish artists shut the space down and keep things closer than in a Gainsborough, whose compositional props seem to ‘drop off’ into a pictorial hinterland by comparison. By technique I am trying to imply the whole physical making (not a set of skills) Goya realises everything in the Gonzaga portrait through the facts of the paint / colour as opposed to the paint working in a subservient manner towards the subject. Goya’s “truth” comes through the medium, his use of colour. I can understand depiction in more philosophical or even wider painterly terms too , but – maybe sadly – prefer the clunky literal definition.